LeViness, Tolzman & Hamilton P.A. and Partner Bryan J. Chant recently secured a settlement in the amount of $100,000 from Nationwide Insurance Company for a client who suffered serious injuries as a result of a rear-end collision on the Eastern Shore. 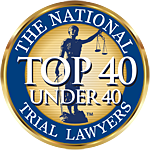 Nationwide Insurance attempted to low ball our client and Mr. Chant immediately filed a lawsuit in the United States District Court for the District of Maryland. Mr. Chant refused to let Nationwide Insurance Company off the hook and eventually won a settlement of $100,000, which was the full amount of the insurance policy. If you have a claim against Nationwide Insurance Company, call Partner Bryan J. Chant at 800-547-4529 or submit an online inquiry for an absolutely free consultation.